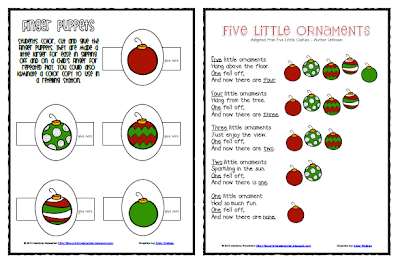 Lil Country Librarian: Five Little Ornaments Subtraction Emergent Reader with FREEBIES! 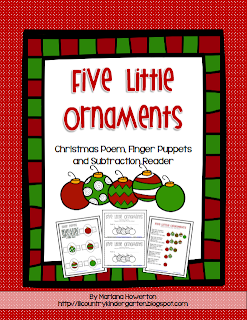 Five Little Ornaments Subtraction Emergent Reader with FREEBIES! I'm having so much fun being snowed in that I might be guilty of refreshing the school closings web page of our local news station no more than 8 million times in the last hour to see if my school has been added to the list. Yes, I receive texts from the Principal, Facebook messages, emails and a phone call, but knowing right away is such an amazing feeling! ;) Ha! Does anyone else share in this excitement? This morning, I created an emergent reader and a few freebies to go along with it. Be sure to check them out! Click on the pictures to take you to my TpT store to purchase the reader or download the freebies! Just so you know, the freebies are included in the reader file if you purchase it.